If you have an authentic Tiffany Studios lamp, we can get a very good, guaranteed price for your lamp at no cost or fee to you. We work in a professional, organized manner which is described below. We work in much the same way as a real estate agency. When we agree to work together, we have a simple written agreement. The agreement will state exactly what we guarantee to you for a “net” price, how and when you will be paid, etc. That's the professional way to do things, to protect you, and it's the way in which any authentic Tiffany lamp will sell more quickly, and in our experience, for the best price. You may think that "shopping your lamp around" to a dealer, auction house or online is the way for you to get the best possible price. That's simply not true. In this business, if you "shop around," you run the risk of over exposure, which will have the opposite effect. Dealers must buy "wholesale" and sell at high retail to cover their overhead. Auction houses "set records" at times when selling a very rare Tiffany Studios lamp, but they don't guarantee you a sales price or even that your lamp will sell. They will also want commissions, fees and other costs from you which can take away up to 15-30% of what the final price was for your lamp (s). We work much differently. We make our money from a modest "finder's fee," paid to us by the buyer after the sale. When we work with you, everything will be simply spelled out as to the exact sales price (which we will discuss with you in email and/or by phone in advance after seeing very good photos), in our "brokerage agreement." We will tell you if your lamp appears to be authentic, and provide you with a price range of what we feel we could sell it for to one of the numerous collectors we have on file. We will broker your Tiffany lamp in a professional, discreet and private manner. We've built a large base of buyers and sellers nationally, who trust us, and who depend on our expertise, market knowledge, discretion, confidentiality and integrity. There is no "drama," no hidden fees or "disclaimers," and we do all the work. Also important, you will be paid within ten business days of your lamp selling, unlike the 2-3 months most auction houses wait to pay their consignors. After reading the information provided on our site, if you have a short question, we invite you to use the form below to ask us and we'll try to answer it for you. Otherwise, please fill out the “Lamp Evaluation Form.” It gives us much more to go on, so we can truly assess your lamps authenticity, salability and market value. 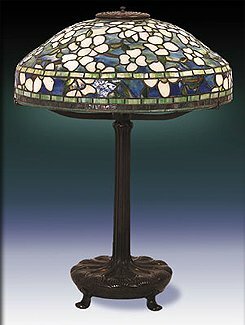 The largest cost to the owner when selling a genuine Tiffany lamp at auction or through a consignment gallery are the various "fees and commissions" (plus the high cost to pay to have someone professionally pack, ship and insure the lamp (s) they send) they must pay for selling their item (s). These fees can amount to between 20-40% of the sales price for an item. We take a much different approach. All buyers have to pay a commission if they buy at any auction house, or pay more if they buy from a consignment gallery. We charge the buyer a much lower "finder's fee" commission after the sale, putting none of the costs or commissions onto the owner. We don't make as much per item as if we were getting a typical 20-40% fee from the seller like auctions or consignment galleries receive. We make up for that in quantity of sales by maintaining a large, established list of qualified collectors interested in buying discreetly, quickly and easily through us. We can afford to work this way because we keep our overhead low. We don't have an extravagant gallery or Manhattan showroom, with the accompanying high rent, advertising, and other monthly costs. What we do have is experience, knowledge and a long-standing reputation in this very specialized field of collecting. To take advantage of our “buyer pays all the fees” approach please compete our Tiffany "Lamp Evaluation Form". You'll also be asked to send us good quality, digital images of your lamp. Examples of the types of photos we'll need can be found on our "Tiffany Lamp Examples" page and on the "Thank You" page after submitting the form. When we receive the required information from you, you will hear back from us within 24 hours. When we agree to broker your lamp (s) and enter into an agreement, we work as quickly as possible to discreetly and properly promote and sell your lamp. We work long days, seven days a week, to find a very good buyer for your lamp. We keep all aspects of the promotion and sale of your lamp private. We always keep your identity and location completely confidential. Generally we find a buyer for most lamps (very rare, very high value lamps are sometimes an exception) within 7-10 business days. Auction houses take months before they even have a lamp sale (generally they are about six months apart). Then, the owner will wait 30 days minimum before they are paid (assuming the lamp sells). Our clients are paid within seven business days from the time we receive the funds for the sale (within a business week). Lamp owners working with us are paid with "guaranteed funds" - a cashier's check or electronic bank "wire transfer." 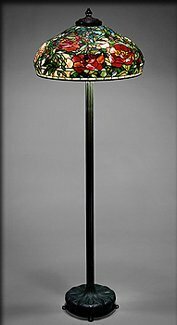 The Dangers and Consequences Of "Over Exposure"
If you've already shown or offered your Tiffany lamp to dealers, collectors or auction houses, (by phone, at "online auctions," via email or otherwise), scores, hundreds, or even thousands of people will have seen or heard about your lamp. The world for authentic Tiffany Studios items is relatively small. Collectors, experts, museum curators, auction house employees, dealers, and restoration people talk with each other frequently about pieces they saw or heard about from someone. They often "swap" photos. This can seriously hurt any efforts to get the best price for your lamp, remain "private," or even sell it at all. If a lamp has been "shopped around" various places for weeks or months, it might not sell, unless it is at a highly discounted price. We will broker your lamp for a good price, as quickly as possible, in an efficient and professional manner. Feel free to call any of the many people listed on our "References" page, who have worked with us and known us for as long as forty years. We are here to help you if you have a genuine Tiffany lamp. Years of experience and maintaining a fine reputation are just a couple of the reasons we can be of great help to you from start to finish.